Unlimited admission to the Central Wisconsin Children's Museum - including Baby Play, Story Share, Toddler Music, Amazing Art and more! This membership level includes unlimited access to the Central Wisconsin Children’s Museum and drop-in programs, 4 free guest passes and 50% off admission to over 200 children’s museums nationwide for up to 2 adults and all children in home. All primary members must reside in the same residence. A portion of a Enhanced Membership is tax deductible. This membership level includes unlimited admission to the museum and drop-in programs for one year. The membership if good for up to 2 adults and all children in home. All primary members must reside in the same residence. 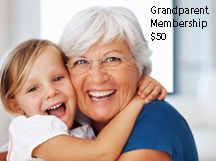 This membership level includes unlimited access to the museum and drop-in programs for up to 2 grandparents and all grandchildren. Grandparents must reside in the same residence. Weekly in June and August on Tuesdays-Thursdays the museum offers drop-off 4-hour camps from 9am-1pm. All sessions feature specific educational directives, art projects, and a snack that goes with the theme. Campers are asked to pack a nut-free lunch. Register early, spaces limited. All campers and counselors receive a t-shirt! Fees: Campers $75.00 per session or $65.00 for members; counselors $40 per session or $30 for members. All sessions • 9 -12 year olds - Help set up and tear down the events for the day, help campers with their activities, and enjoy the experiences of “being in charge”. 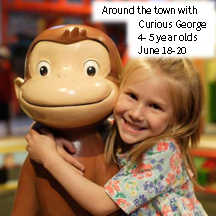 Join Curious George on his many adventures as we read and re-enact one of his books. Campers will make pizza, fly a kite at the river, splash in the public square fountain, and more! Learn to appreciate living things. Activities may include: planting seeds, vegetable stamps, pressed flowers, tree sketches, and leaf rubbings. There will also be live critters to see and hold! Learn how to make: smoothies, kabobs, pizzas and more! 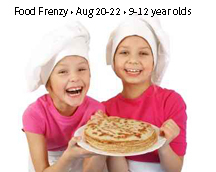 Children will have fun, fill their bellies, and learn basic kitchen skills.